Nenana Ice Classic officials announced the ice thickness of the Tanana River recently. It was the thinnest ice ever recorded on the Tanana in January. To be fair, the Nenana Ice Classic contest may be over 100 years old, but officials only started announcing the ice thickness back in 1989. January ice thickness usually falls between 30 and 45 inches in January. In 2019, the thickness was only 16 inches. The previous low was 21.5″ in 2004. The Tanana River froze over in October, which is normal, but we had such a mild first half of the winter, that the ice has not thickened to normal levels. That is the case for rivers throughout Interior Alaska right now. River travel has been sketchy in spots. The annual Nenana Ice Classic is Alaska’s longest running game of chance. Every year we guess the date & time the ice “goes out” on the Tanana River. Tickets for the 2019 event go on sale February 1. 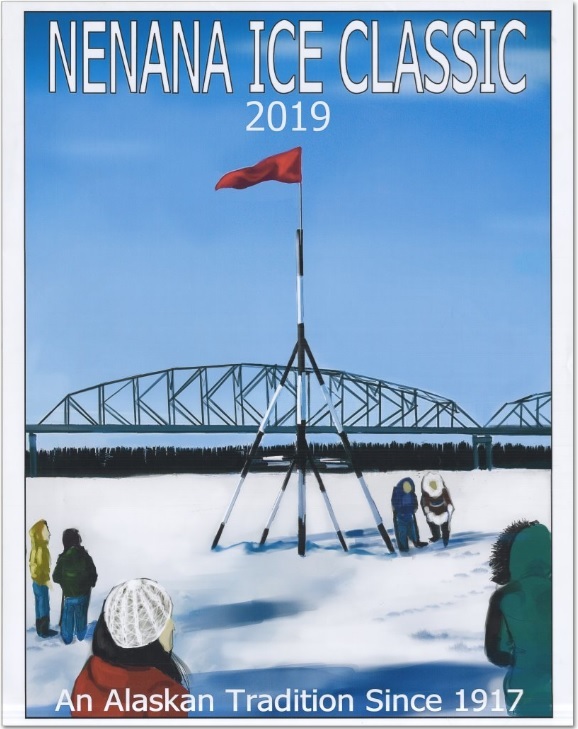 This entry was posted on Wednesday, January 23rd, 2019 at 7:07 AM	and tagged with history, ice, nenana ice classic, tanana river, travel and posted in Alaska. You can follow any responses to this entry through the RSS 2.0 feed.